Angsty and intense. Real and sweet. Incredibly insightful to get into the intriguing mind and passionate heart of our favorite bad boy, Travis Maddox. Finally, the highly anticipated follow-up to the New York Times bestseller Beautiful Disaster. Can you love someone too much? Travis Maddox learned two things from his mother before she died: Love hard. Fight harder. In Walking Disaster, the life of Travis is full of fast women, underground gambling, and violence. But just when he thinks he is invincible, Abby Abernathy brings him to his knees. Every story has two sides. In Beautiful Disaster, Abby had her say. Now it’s time to see the story through Travis’s eyes. Awww, my sweet, sweet Travis Maddox. It was so great to hear his thoughts, understand his feelings. 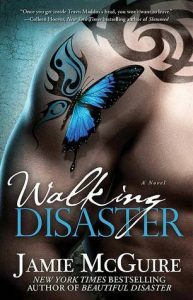 If you think you love Travis after Beautiful Disaster (see my review), I think you will love him even more after Walking Disaster. He’s such a flawed individual, but with such honest intent and with such a good heart. He feels to much, he gets too angry, he is irrationally overprotective and perhaps, he loves just too fiercely. Before I began reading, I was honestly a little worried about what to expect in this book. I wondered if it would be a struggle to read, a simple re-hashing of Beautiful Disaster, but I was surprised that there were many new parts… some completely new and some extensions of scenes we read about. I was really glad I re-read book 1 just before starting this, as it had been over a year since I had read it. I remembered a lot of the story, but the specifics were fuzzy, so going from one book to the next help me to better connect the scenes and understand the subtleties. The prologue was a sweet, heart-wrenching surprise that helped me understand what solidified Travis’ desire to look for something special. It was fun to see how the relationship between Travis and Abby initiated through his eyes. While reading BD, I hadn’t really thought that he questioned the pull he felt towards Abby so much, but through his POV, you realize he is constantly at battle with himself and his emotions. What I WAS surprised at was how I felt towards Abby. I thought that being on the receiving end, in other words, seeing her through Travis’ eyes… I felt, quite frankly, like she was really bitchy. And the epilogue! It was perfect!!! I won’t say anything to avoid ruining it for anyone, but it was such a great surprise and a lovely close to this series! I truly loved it!!! Overall, I think Jamie McGuire did a really good job of explaining Travis–I totally got him. I love him. I think he’s just so real and this book helped me better understand his internal battles and how he helped to overcome them and how he became a better man.